The cookies will keep for up to 4 days in an airtight container. Used in conjunction with the Tender Tart Dough recipe. 1. Prepare the dough recipe, stirring in the lemon zest when adding the egg yolks. Shape the dough into logs that are an inch across and wrap in plastic wrap. Chill until firm, about 2 hours. 2. Preheat the oven to 325 F and line 2 baking trays with parchment paper. 3. Pour the turbinado sugar onto a plate. Unwrap the cookie logs and roll them in the sugar to coat. 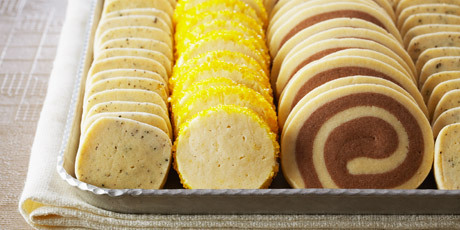 Slice the cookies about ¼-inch thick and place on the baking trays, leaving a ½-inch between them. Bake the cookies for about 15 minutes, until lightly browned on the bottoms. Cool the cookies on the tray and then store in an airtight container. 1. Prepare the dough recipe, stirring in the tea from the tea bag when adding the egg yolks. Shape the dough into logs that are an inch across and wrap in plastic wrap, then flatten them on 4 sides to create a square shape. Chill until firm, about 2 hours. 3. Slice the cookies about ¼-inch thick and place on the baking trays, leaving a ½-inch between them. Bake the cookies for about 15 minutes, until lightly browned on the bottoms. Cool the cookies on the tray and then store in an airtight container. 1. Prepare the dough recipe, then remove half of the dough to a separate bowl. Stir the cocoa powder into that separate bowl of dough until incorporates. Shape each piece of dough into a disc and wrap in plastic wrap. Chill until firm, about 2 hours. 2. On a lightly floured work surface, roll out each piece of dough to a square about 8-inches across and just under a ¼-inch thick. Place the chocolate dough over the plain dough, trim the edges and carefully roll up, creating a spiral effect. Wrap the cookie log and chill until form again, about an hour. 3. Preheat the oven to 325 F and line 2 baking trays with parchment paper. 4. Slice the cookies about ¼-inch thick and place on the baking trays, leaving a ½-inch between them. Bake the cookies for about 15 minutes, until lightly browned on the bottoms. Cool the cookies on the tray and then store in an airtight container.